A submergent perennial plant which exhibits rapid growth. Leaves are sharply serrate, oblong, and whorled around the stem with a rough texture. 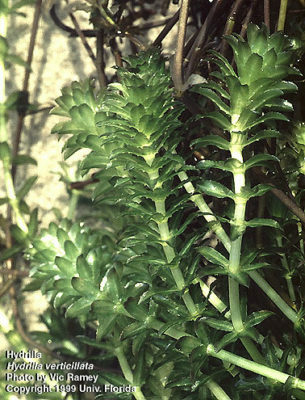 Hydrilla is often confused with Elodea. Hydrilla can be distinguished from Elodea by texture and leaves are usually found in groups of 4 or more. Chemically treating a pond with herbicides approved for aquatic use can be effective for many types of vegetation. Chemical treatments can be very effective in controlling vegetation especially in small areas of a pond such as swimming areas or boat ramps. Herbicides generally provide quick results, but plants often return and several applications may be necessary to maintain control. When using herbicides/pesticides, protect yourself and others by strictly following all label directions. Certain herbicides can be purchased and used only by Certified Pesticide Applicators, so herbicide treatment may not be possible without paying someone to do it for you. Additionally, community or shared waters (several landowners) requires herbicide application to be done by individuals with a Certified Pesticide Applicators License. Individuals that treat their own ponds should keep the rule of thirds in mind when applying herbicides. Treat 1/3 of the pond, then wait at least ten days prior to treating the next 1/3 and then treat the last 1/3 after another ten days elapses. By treating 1/3 of the pond at a time, fish kills attributed to low dissolved oxygen as a result of decaying plant matter can be prevented. Treatments should not be conducted during very hot or dry weather conditions since these conditions often produce low oxygen levels and plant treatments will only further deplete oxygen levels. One of the most effective long term controls for aquatic plants is stocking triploid (sterile) grass carp. Because grass carp have specific food preferences, accurately identifying the plants in your pond is very important. Grass carp consume many vegetation types and have a life span as long as 15 years. Triploid grass carp will not reproduce in a pond, will not muddy a pond, and will not disturb the nests of other fish. Triploid grass carp grow rapidly and will control most submerged (underwater) plants. They will consume as much as 40% of their body weight in plants every day during the summer months. A permit is required from the DGIF to stock triploid grass carp into any Virginia waterbody. Permit applications and information guides are available from any DGIF office. Triploid grass carp should average 10-12 inches at stocking to limit predation. Mechanical harvesting is very time consuming and generally does not result in longterm vegetation control. As a result, this method is not as desirable as herbicide application or triploid grass carp stocking. In cases where vegetation is limited manual removal can work (ie. Cattails).